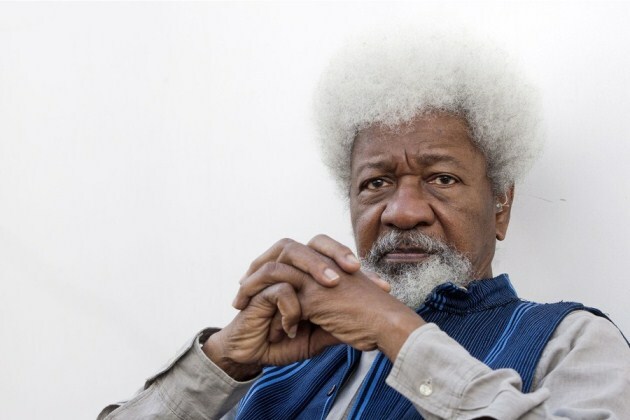 Nobel laureate, Prof. Wole Soyinka, on Monday, in Lagos, expressed disgust with emerging debates on re-election by some politicians in the country. Some northern governors on the platform of the All Progressives Congress and some allies of President Muhammadu Buhari on Saturday backed the President for a second term. The declaration came on the heels of the open declaration of support of the Minister of Women Affairs, Aisha Alhassan for the presidential bid of former Vice-President Atiku Abubakar, who the minister declared as “our president in 2019”. But the renowned playwright is not amused by the debates going on in the country on the political permutations ahead of the 2019 general elections. Soyinka noted that the current administration had barely gone halfway, wondering why people were already planning to fill political positions. The Nobel laureate spoke with some journalists after a press briefing to unveil the second batch of students departing Nigeria for Lebanon on Tuesday for the Study Abroad In Lebanon programme by The Cedars Institute, Lebanon, in collaboration with The Wole Soyinka Foundation. On performance of the current administration, the revered writer said there were “yawning gaps”, noting that an average Nigerian was now less secure than he was few years ago. He said, “Take simple security for instance. The average citizen feels less secure now than he did a few years ago; that is evident. When people talk about state police, there are reasons for it. When they talk about bringing policing right down to the community level, they know what they are talking about. This is also part and parcel of reconstruction or reconfiguration. “The economy, there is a big question about it right now. Fortunately, everybody admits that we went through a very bad patch. Right now, it is a question of have we come out of it or not or there is no question at all. He, however, said there was a question of who was responsible for the agony the nation was plunged into in the last two years. Besides, Soyinka said people shouldn’t allow themselves to be put off by those who tried to cheapen the word “restructuring”. The renowned playwright stated, “Like I said when I visited the Women Arise (For Change Initiative) the other day, it doesn’t matter by what name you call it. We all know what we are talking about. We all know that this nation was deconstructed and that what we live in right now as a nation is not along a structure that expresses the true will of Nigerians. “So, when people use words like ‘restructuring, reconfiguring or call it reconfiguration, return to status quo, or call it reformulating the protocols of our association or used a single word like restructuring, it doesn’t matter. Everybody knows what we are talking about. That is number one. “Also, there are those who try to divert the attention away from the main issue by mouthing platitudes, clichés like it is the mind that needs restructuring. You know those I am referring to. “This is a constant process—restructuring the mind. It is both an individual exercise as well as a theological exercise. People go to church and mosque to have their minds restructured. They go to school and extramural classes to have their minds restructured. Restructuring the mind is not the issue. “Nobody is saying that the exercise of restructuring the mind should not be undertaken; it should be undertaken. Anybody who indulges in self-examination is already engaging in an exercise of mental and attitudinal reconstruction. We know that. People shouldn’t try to substitute one for the other. “I find it very dishonest and cheap time-serving, trivialising the issue when I hear expressions like ‘it is the mind that needs to be restructured.’ Who is arguing or denying that? Why bring it up? Why is it a substitute? “We are talking about the protocols of association of the constitutive parts of a nation. We are talking of decentralisation. That is another word. This country is over-centralised. Soyinka, who also commented on Buhari’s position that Nigeria’s unity was settled and not negotiable in the President’s speech after returning from his medical trip to the UK, said he had heard the expression often. He added, “I don’t know why people bother. Again, that is another deploy for sidetracking the issue. Nobody is talking about disuniting Nigeria.